Site. Proper evaluation and analysis about the nearness of the site to slope, bodies of water, vegetation, farmland and wetland should be carried out to reduce any negative impact of the home to the environment. Size. The home should be built at a minimal square footage to reduce the need for heating and cooling systems, building materials and lighting that can harm the environment. Solar. This means that you should decide whether to install a solar energy system as a means of heating water or producing electricity. Energy. Heating, cooling and lighting systems should be considered when planning to build a green home to make sure that you reduce your use of anything that can be damaging to the environment. Water Conservation. Include in your plan natural solutions to save your consumption of water as a means of contributing to saving the environment. 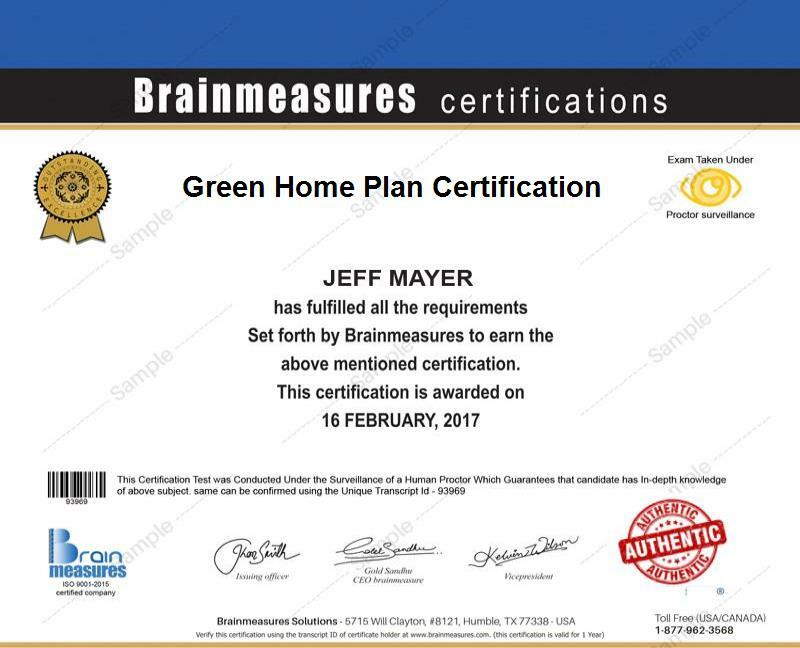 If you want to learn more about green home planning, then the green home plan certification program offered by Brainmeasures can offer you a lot of help. The green home plan course from Brainmeasures makes it a point to emphasize the importance of living in a green home and making contributions in saving the environment. This certification course is also capable of providing you the most reliable green home plan training and this is a huge help in your attempt to fully understand all the procedures involved in building and structuring a home and in making sure that all its major components do not in any way cause a lot of trouble to the environment. The kind of knowledge, skills and expertise that you can receive from the green home plan certification course is also effective in molding you into a more efficient certified green home planner and finally receiving your certificate in the field will allow you to start providing your services to other green living proponents. The green home plan certification program which is now offered by Brainmeasures is a major help in your attempt to understand the basics of effectively building and designing a green home. It is most suitable for general constructors, interior designers, architects, suppliers, manufacturers, trades people, home builders, real estate professionals and any other professionals and homeowners who wish to gain a more in-depth understanding about the specific procedures involved in building an energy-efficient green home. Completing a green home plan certification course allows you to enjoy an immediate increase in your salary considering the many people and organizations that will require your services. If you work as a green home builder after completing your green home plan certification course, then you can start earning within the range of $45,000 to $62,000 annually. Working as a green home plan consultant allows you to earn around $73,000 to $91,000 per year.